See stunning images from past solar eclipses going back to the 1920s. If you can't make it to the South Pacific's eclipse zone in time to watch the sun turn into a "ring of fire" on Thursday, you can still get in on the spectacle online. The annular solar eclipse begins at 6:30 p.m. ET (22:30 GMT) in western Australia. Over the course of several hours, the moon's shadow will sweep across Australia, Papua New Guinea, the Solomon Islands and the Pacific from east to west, fading into the sunset off the coast of South America. Because of the relative position of moon, sun and Earth, the moon can't cover the sun's disk completely. For observers who are situated within a strip of Earth's surface that measures 100 to 140 miles (171 to 225 kilometers) wide and thousands of miles long, only the outer edge of the sun will remain uncovered. That's what produces the eerie ring of fire. The sight will be much like what was visible during last May's annular solar eclipse, and the course of the eclipse will be similar to the Pacific path that was taken by the moon's shadow during last November's total solar eclipse. If you are in the zone for the ring of fire, be careful: Even that slim ring of sunshine packs enough of a punch to burn your eyes, and you'll need to take precautions. Those precautions can take the form of eclipse-viewing glasses or filters, or pinhole-camera rigs that let you view the eclipse indirectly. Caution should be the watchword as well for those who can observe the eclipse's partial phase from a wide swath of the Pacific, ranging from New Zealand to Indonesia and Hawaii, as shown in the animation below. NASA's Eclipse website provides further details, including precise time schedules for the eclipse in a variety of locales. An animation from Eclipse-Maps shows the progress of the annular solar eclipse over Australia and the South Pacific. The outer curve shows where the sun is partially eclipse at the given time. 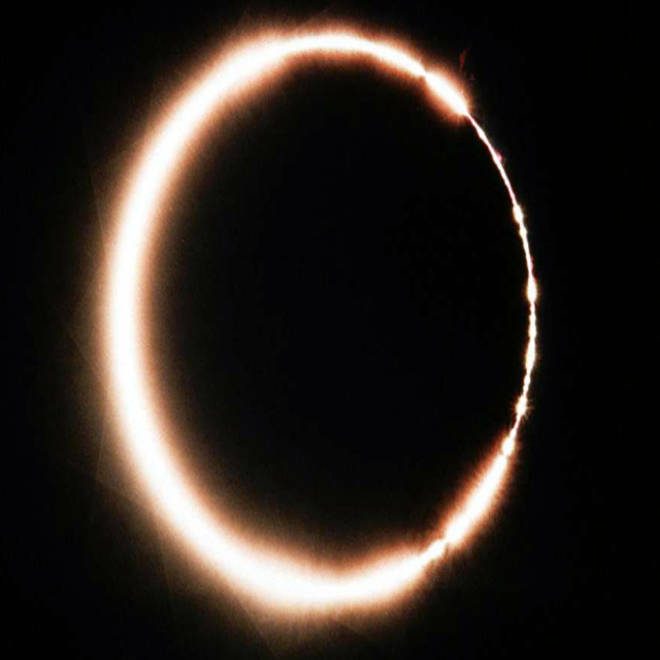 The small inner curve shows where the annular eclipse is in progress. Slooh Space Camera: Slooh's coverage begins at 5:30 p.m. ET, during the partial phase that leads up to annularity. Slooh's team will provide the commentary for live video feeds from Tennant Creek, Cape Melville National Park and Cairns in Australia. The show also will feature occasional shots of the unsullied sun from Arizona's Prescott Observatory. You can use a Web browser or Slooh's iPad app to tune in. Coca-Cola Space Science Center: The Georgia-based center will provide a live video feed from Australia's Cape York starting at 5 p.m. ET. Amateur webcams: Australian skywatcher Gerard Lazarus is gearing up to capture live video of the eclipse, and there may be other on-the-fly feeds. Follow the Twitter hashtag #ASE2013 for updates. Television Down Under: The eclipse is likely to make news Down Under, and it's worth checking Sky News Australia and 3News in New Zealand for TV coverage. If you miss it: Check SpaceWeather.com, Space.com and Universe Today for images of the eclipse after it takes place. You'll also want to keep tabs on Geoff Sims (@beyond_beneath) and Colin Legg (@colinleggphoto) on Twitter. If you catch it: Got pictures? Please feel free to share 'em with us via NBCNews.com's FirstPerson photo upload page, and we'll pass along a selection of eclipse pics. Flash interactive: What causes a solar eclipse? Tip o' the Log to Michael Zeiler and Amanda Bauer for eclipse tips.